It was thought that it would rather taken it than make it to the garden stone because this rock was at the position that just became obstructive when riding into the garden by car for years. However, the method of taking because of a big rock it was not understood and the current the state as it is. 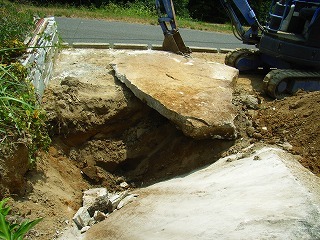 As for the seen part on the ground, the part where this rock has buried the below is larger though about 1m in height. Because the method of driving the fid (wedge) to the stone on the television and dividing the stone was broadcast, this decided to be tried. Because it goes well when trying, it introduces it. The rock pierces with a drill and the wedge is driven. This is the big rock (stone). First of all, the rock pierces with a drill. The drill is TE-22 of [HILTI], and the blade is a concrete bit of [HILTI]. A concrete bit of [HILTI] can also puncture the stone. It pierced with a drill according to the crack because it had seamed to this rock a little by chance. The fid of drill steel (wedge) is driven to the made hole with a large-scale hammer. This wedge is the one having bought it in the hundred-yen store. It is necessary to prevent garbage from entering eyes to pierce with a drill, to use the hammer, and to process the stone by drill steel. I think that you should use safety glasses of usual glasses though it is better. It might be impossible in such a fid when there is no crack in the rock at all. Please process such a fid with the grinder or use the special wedge (SERIYA) only for stone better more remunerative. The stone was packed in the space of the rock and the space was expanded little by little after all. When the space was expanded by bar of big iron, the stone was packed. It pulled at a dash by the backhoe when the space became about 10cm and it peeled off. It was very difficult though heard as possible to be done easily when saying actually. Anyway, the size of the stone is too large. There were 2.5m in length and 1.8m in width 25cm in thickness in this photograph. I think that there are 2-3-ton weight. 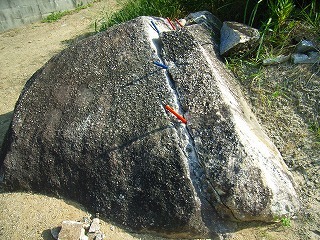 The stone of 2.5m in length, 1.8m in width, and 25cm in thickness is huge. 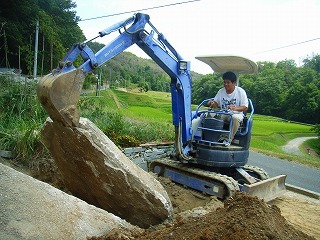 It is not possible to move easily by this backhoe (Mitsubishi about 2.2 tons in total weight of the MM20CR machine). I moved little by little while pulling by the backhoe and pushing only one of the stone. The stone is used as a garden stone. It paved in the garden and it decided to use it because it did not usually disturb even if you used it as a stone in the garden. It digs up the place where the stone in the garden is put in about 25cm in depth. Because the stone is large, the stone can be put only once. The re-doing is not effective when failing. First of all, it is impossible to take out the stone from among the hole. The stone was put carefully measuring. It might be made well. The ruggedness of the face of the stone (ruggedness) is hung the bulging part in drill steel or goes well when the ditch is cut at intervals of 1-2cm while pouring water on the diamond cutter and it hangs it in drill steel. 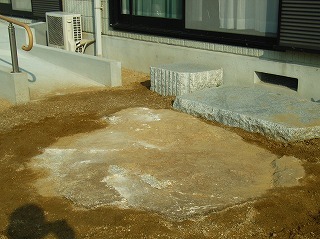 If the stone is put on the garden like this, the thing can be dried on this. Moreover, it is convenient also for a little labour for farming and the eating and drinking sitting.